If you love watching movies sports and shows online (did i say for free as well? ), then you owe it to yourself to get aquainted with the free open source media player that is, XBMC. If you're unfamiliar with the software then read our XBMC Review here. Put simply, this software rocks and is the BEST way to organise your media files, DVD rips and any other kind of video, TV show or music files you have lying around. Once installed you will be presented with the best interface that drags in meta data from the web for your files, showing fanart, movie posters, plots, reviews and much, much more. But thats not all... You can also install a number of add-ons (a bit like apps on your phone/tablet) that will give you access to free TV channels, movies and TV shows that update daily. You can also customize the look of the software by adding a number of skins to get the look you want. Sounds good? Then check out this great XBMC installation guide, and start enjoying your media much more. Just use the links on the left to install, configure and customize XBMC. XBMC is the number one media centre and player that can be installed on most operating systems and devices such as PC, Mac, Linux OS, tablets and iOS, giving you the ability to watch all your networked media files including movies, music, pictures and tv shows. The software will automatically drag in metadata for your media content including pictures, cast details, reviews etc. You can also watch internet TV services from around the world and watch TV shows and movies by tapping into a massive range of add-ons and repositories. Because the software is open source and constantly being improved and added to by the community, some people can get a little confused with the myriad of options, features and add-ons. But this software is so good that you need to install it onto your system. We cut through the confusion and are here to make installing this gem of a program plain sailing. First thing, read our XBMC startup guide to find out why XBMC is so great and why you need to install it today. Then if you're ready to get up and running with a shiny new media center in minutes - read on. First thing you need to do is make use the links on the left under the Installing XBMC option, just choose the operating system you would like to install the software onto and our guide will help you load and configure it. Each operating system installs XBMC in a different way, but the end result is the same front end. When you have finished installing XBMC the look & feel is the same for all the operating systems so if you move from one type to another type of operating system to another, such as use on your phone, mobile or computer then the XBMC interface and controls will all be the same. Once you have installed the software we need to get hooked up to your media files. So the next part is configuring XBMC and setting it up so you can play your Movies & TV Shows from your home network. 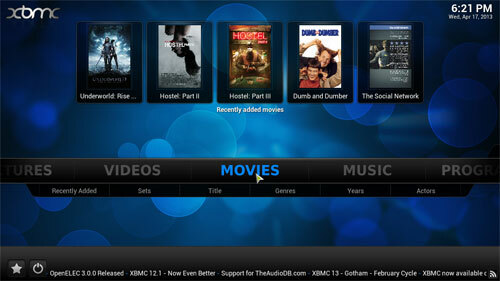 XBMC categorizes your files into TV shows, movies, music etc. We will start by setting XBMC up to play Movies, select " Adding Movies To XBMC" under Configuring XBMC option on the left. Next we will be setting XBMC up to play TV Shows by selecting "Adding Movies To XBMC" under Configuring XBMC option on the left. After that we will be setting XBMC up to play Music MP3/AAC/M4A/WMA etc by selecting "Adding MP3 Files To XBMC" under Configuring XBMC option on the left. Once this is done, you can start exploring the add-ons and repositories that are available. We have guides showing how to install the best ones available. Just select from the menu on the left or check out our xbmc add-ons page.